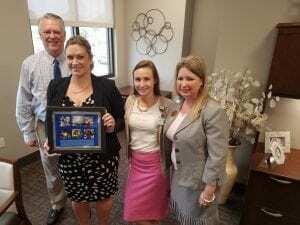 Pasco Kids First CEO Rick Hess, Director of Development Becky Bennett and Board of Director Paul Friedlander presented North Bay Hospital CEO Sarah Naumowich and COO Jennifer Kotwicki with a shadow box of photos from the 10th Annual Pasco Kids First Family Fun Day. Morton Plant North Bay Hospital partnered with St. Joseph’s Children’s Hospital as the presenting sponsor of the event held in Sims Park with 10,000 in attendance. More than 50 vendors provided kids with activities such as games and crafts while parents learned about community resources. Community partners including the Pasco Sheriff Office, New Port Richey Fire Department, Pasco County Health Department and the Bikers Against Child Abuse provided vehicles in the touch a truck activity to allow children to sit in the vehicles and take photos. The 11th Annual Pasco Kids First Family Fun Day is scheduled for November 3rd, 2018. Contact Becky Bennett for sponsorship opportunities at bbennetthfpasco@aol.com. Pasco Kids First, Inc. shared a post. We are always looking for ways to help mommies, daddies and babies in our community!! Follow the rules below to be entered into a drawing to win this diaper bag stuffed with goodies! WHAT WAS THE BEST ADVICE OR TIP YOU WERE GIVEN DURING YOUR PREGNANCY? ~Get an entry into the drawing!! ***Tag 3 people who are pregnant for an extra entry!!! Winner will be randomly drawn on 4/30/19 and announced on 5/1/19. Pasco Kids First, Inc. is with Lori A Ashmore and Angelita Rodriguez.